Balamuc appears in 2014 as a manifesto-free experimental platform of three emerging artists from Timisoara, Livia Coloji, Răzvan Cornici and Ana Kun. The With Broad Strokes // Sketchbooks project is a natural continuation of the group’s interest in drawing, notation, sketch, as is apparent from Norma, a drawing a day / keeps the doctor away, a kind of collective sketchbook which can be browsed online and offline. The sketch is an uninhibited investigative and documentation tool, implicit in the artistic practice. From drawing to text and doodle, it briefly narrates one process, two, dozens, without discrimination and filters. The sketchbook becomes something between an assembly manual and a map of all possibilities, useful for both the artist and the browser. 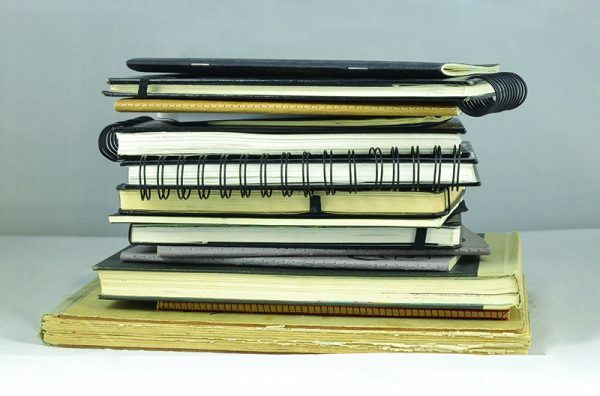 Balamuc presents the notebooks of several visual artists in With Broad Strokes // Sketchbooks.